Amazon is on a building spree, and many local officials are eager to bring one of its giant fulfillment centers to their own backyard. They are so eager, in fact, that some have resorted to offering the company lavish tax breaks and other public assistance. 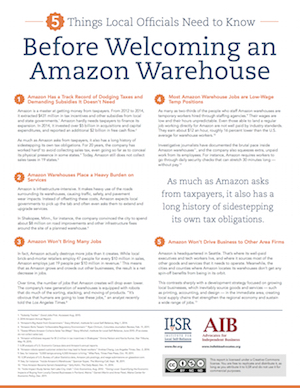 Between 2012 and 2014, Amazon picked up $431 million in local tax incentives to finance its warehouse expansion. Yet, as our analysis shows, Amazon fulfillment centers impose so many hidden costs on local economies that cities ought to reconsider welcoming them at all, much less greasing the way with public funds. Amazon is infrastructure-intensive. It makes heavy use of the roads surrounding its warehouses, causing traffic, safety, and pavement wear impacts. Instead of offsetting these costs, Amazon expects local governments to pick up the tab and often even asks them to extend and upgrade services. In fact, Amazon actually destroys more jobs than it creates. While local brick-and-mortar retailers employ 47 people for every $10 million in sales, Amazon employs just 19 people per $10 million in revenue. [vii] This means that as Amazon grows and crowds out other businesses, the result is a net decrease in jobs. Amazon is headquartered in Seattle. That’s where its well-paid executives and tech workers live, and where it sources most of the other goods and services that it needs to operate. Meanwhile, the cities and counties where Amazon locates its warehouses don’t get any spin-off benefits from being in its orbit. [i] “Subsidy Tracker.” Good Jobs First. Accessed Aug. 2015. [ii] 2014 Amazon Annual Report. 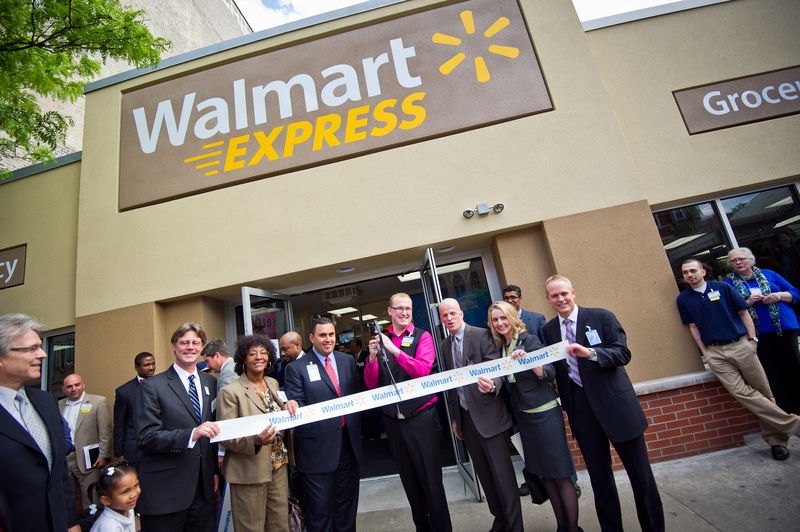 [iii] “Amazon’s Big Assist from Government.” Stacy Mitchell, Institute for Local Self-Reliance, May 1, 2014. [iv] “Amazon Bolts Texas’s ‘Unfavorable Regulatory Environment.’” Ryan Chittum, Columbia Journalism Review, Feb. 11, 2011. [v] “States Where Amazon Collects Sales Tax (Map).” Stacy Mitchell, Institute for Local Self-Reliance, June 2015. (Five states do not collect sales tax). [vi] “Amazon withdraws request for $1.2 million in tax incentives in Shakopee.” Emma Nelson and Kavita Kumar, Star Tribune, May 19, 2015. [vii] ILSR analysis of U.S. Economic Census data and Amazon’s annual reports. [viii] “Amazon robots speed customer orders but may lead to fewer workers.” Andrea Chang, LA Times, Dec. 2, 2014. [ix] See, for instance: “3,000 temps among 4,500 Amazon is hiring.” Mike Pare, Times Free Press, Oct. 19, 2011. [x] ILSR analysis of U.S. Bureau of Labor Statistics data, Amazon job postings, and wage submissions on glassdoor.com. 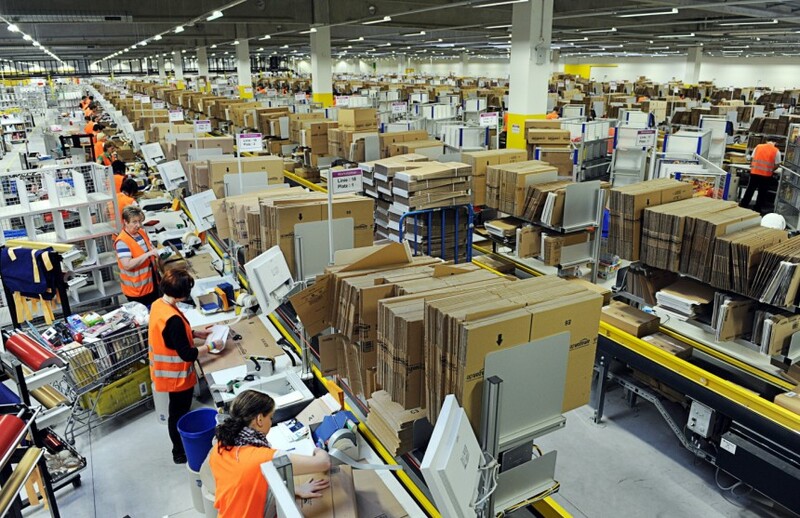 [xi] See, for instance: “Inside Amazon’s Warehouse.” Spencer Soper, The Morning Call, Sept. 18, 2011. [xii] “How Amazon Became Santa’s Sweatshop.” Sally Kohn, The Daily Beast, Dec. 11, 2014. [xiii] “Indie Impact Study Series: Salt Lake City, Utah.” Civic Economics, Aug. 2012. “Going Local: Quantifying the Economic Impacts of Buying from Locally Owned Businesses in Portland, Maine.” Garrett Martin and Amar Patel, Maine Center for Economic Policy, Dec. 2011.